For the vast majority of homeowners, windows are simply a means to an end: they let natural light in, they allow for a cool breeze when opened and a defence against the elements when closed. It’s understandable that homeowners wouldn’t want to concern themselves with window specifications and terminology. That said, when it comes time to purchase replacement windows, homeowners should be armed with information that will allow them to make an informed decision about how to proceed. The following guide outlines the different parts of a window. It’s designed to help homeowners understand how different window components come together and what features to look for during the replacement process. It will also look at the design features that set Magic Window Innovations apart from the competition. Also known as insert and retrofit windows or frame replacements. These are windows specifically designed to fit into a pre-existing window opening. Replacement windows are often the highest performing products in a manufacturer’s product line and are commonly used in replacement or new build applications. Designed for new homes, or for situations where the existing window has to be removed down to the studs in order to be replaced. That said, replacement windows can often be installed “frame-out”. Many companies commonly remove old windows down to the stud, including trim, internal insulation and external flashing in order to install replacement windows. We would need more than just one blog post in order to fully explain the complexities of glass, but here are some key components and terms relating to window glass that homeowners may encounter during the process of purchasing new windows. These terms refer to the cut piece of glass that fills the window frame. If a window has one pane of glass, it is a single-glazed window; two panes, double-glazed; three panes, triple-glazed. Most domestic windows on the market are either double-glazed or triple-glazed. Many companies claim that their triple-glazed windows are more energy efficient than double-glazed windows, but this is misleading. 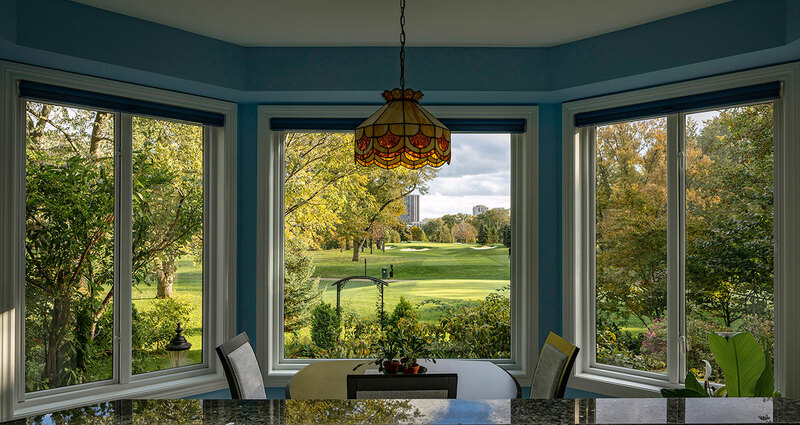 While our custom-made double-glazed windows pass the rigorous energy-efficiency standards of programs such as Energy Star and the National Fenestration Rating Council (NFRC), many other double-glazed designs do not. This leads to the need for the additional pane. The extra pane adds another layer of low-E coating, which can darken the window and affect light transmittance. Another drawback of triple-glazed windows is that they add significantly more weight onto the window’s hardware. Considering most windows on the market utilize crank hardware, this added weight can work to reduce the lifespan and performance of a window unit. Low-E coating is effective because it’s often tailored to specific climate regions. In warmer climates, for instance, the glass can be formulated with a coating that wouldn’t let in any heat. 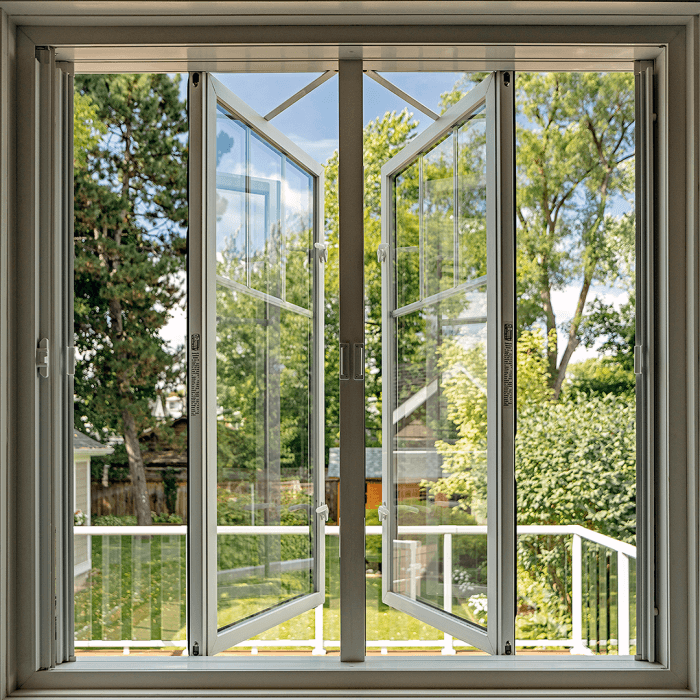 Conversely, Canadians are exposed to a wide-range of seasons that can affect window performance. In Southern Ontario specifically, the climate can vary from frigid winters to very hot summers and everything in between. As such, the Low-E formula must act in balance. It’s key to formulate the coating to allow homeowners to take advantage of the sun’s heat in the winter, while not having it be overwhelming in the summer months. The ultimate goal of Low-E coating is to maximize the thermal efficiency of the window according to the climate. This term describes the rate of heat loss through a window. The lower the U-factor, the better the window is at mitigating heat loss.3 This is obviously a crucial factor in determining whether not a window is energy efficient. In fact, it is one of the fundamental performance indicators for the Energy Star program. A method designed to further improve the insulation of a window. Gas fills are an essential step in creating an insulated glass unit (an IGU). In these units, manufacturers fill the space between the glass units with krypton or argon gas. These heavier, noble gases are preferable to air because they can better impede the transfer of heat through a window. Most IGUs on the market are separated by ¾ of an inch. Because our patented parallax® hardware can stand more pressure and external torque than these traditional crank windows, we are able to extend that space to a full inch. This means we can fill our IGUs with 25% more gas. More gas leads to more effective insulation. Another integral part of an insulated glass unit. They act as seals which insulate the edges of the unit and keep the glass panes firmly apart from each other. 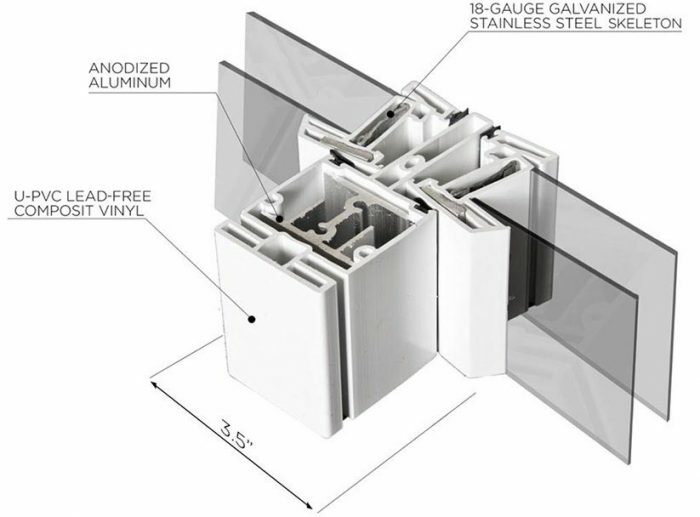 These spacers are essential to a window’s ability to remain energy efficient over the long term. At Magic Window Innovations, we take this technology further. We utilize a duralight soft edge spacer made of a 4-layer material that naturally expands and contracts with any movement of the unit. This makes seal failure virtually impossible. Glass formulation is essential to the performance of any window. That’s why we don’t take any chances. We formulate all of our own glass units in-house to ensure high-performing, long-lasting windows. The customization of our glass also allows us to maximize a window’s performance in accordance with a home’s specific geographic region and construction. The frame is the structure that both surrounds and supports the entire window unit. A frame’s components can vary depending on the type of window being installed, but there are main components that are fundamental to every frame. Head: The horizontal section that forms the top of the frame. Jambs: The vertical sections that form the sides of the frame. Sill: The horizontal section that forms the bottom of the frame. Sash: The moveable panel that holds the glass and the framework of the glass firmly locked in place. Mullions: A vertical or horizontal element of the frame that forms a division between the different glass units of a window. Frames are essential for the strength, structural integrity and aesthetic quality of any replacement window. They are traditionally made from a variety of different materials. Vinyl windows are durable, energy efficient and require very little maintenance. This makes them the most cost-effective windows on the market. For added performance, Magic Window Innovations uses a modified vinyl window frame design. Our Hybrid Fusion Frame design uses a skeleton of steel and aluminum wrapped in vinyl (U-PVC). In this way, we provide the best of both worlds: the strength and durability of steel and aluminum with the efficiency of high-performing U-PVC. Our frames adapt to weather fluctuations, keeping the home better insulated year-round. We’ve also improved on traditional frames with our ultra-slim design, which reduces the frame’s size and maximizes the glass surface to create a more contemporary look. While standalone aluminum frames are durable and relatively inexpensive, they have a very high U-factor. As mentioned earlier, U-factor is a measure of thermal transmittance or the rate of heat transfer through a material. Aluminum loses heat and cold very quickly, making it the least energy efficient frame option. Wood frames are sturdy, constructed from a renewable resource and have a high aesthetic value. That said, wooden window frames are very expensive, require regular maintenance (painting, sanding, caulking) and are prone to rot and mildew. They can also expand and contract in extreme weather conditions leading to insulation issues. Composite frames can be used in a number of different applications because they appear to be solid wood, but are in fact a combination of materials such as wood, vinyl and resins that come together during the manufacturing process. Fibreglass frames are becoming increasingly popular in the industry. It is the newest material to be used in window frames. Fibreglass is strong, durable and requires very little maintenance. For added insulation, many manufacturers will fill the frame’s hollow core with foam. Window hardware is responsible for controlling the basic functionality of a window. Quality hardware is crucial to the long-term performance of any replacement window or new construction window. Traditional casement windows open and close by means of a hand-crank mechanism. When the window is open, a friction hinge or a stay holds the sash in place. Even though cranks have been used for decades, they are mechanically flawed. They will strip, break and loosen over time, especially when they are used on heavier triple-glazed windows. That’s why we decided to do something different. Our patented parallax® hardware turns outdated casement crank windows into crankless feats of engineering. Instead of operating the sash with a crank, our revolutionary parallax® hardware allows homeowners to swing the sash outward by sliding it seamlessly along a horizontal axis. This functionality also allows homeowners to “grab” air from the exterior of the home to help keep the interior cool. Our patented hardware can stand much more stress and weight than traditional crank windows and outperform these outdated designs in every way possible. This secure locking system holds the window in place in two or more places simultaneously. The locks grab the sash and push it firmly up against the frame. A cam locking mechanism consists of both a base and a cam. The cam sweeps or rotates on the base before latching onto the sash, holding it locked in place against the frame. Magic Window Innovations fashions both our cam and multipoint locking systems from stainless steel to ensure security and peace of mind. In order to prevent the buildup of rainwater in the window unit, windows should be outfitted with drainage systems. Our patented polycarborbonate drain eliminates the buildup of water while simultaneously preventing air drafts and insect penetration. Screens and blinds are designed to cover the opening of a window to shield light, heat, dust, insects and other outdoor debris from entering the home. Whereas traditional blinds are vertical or horizontal slats constructed from a variety of materials, screens are traditionally made of tightly-woven wire. While screens and blinds are both essential components of a window, these traditional designs have a number of flaws. They collect dust, they attract dirt & mildew, they block natural light, they obstruct views and contain flawed hardware. Not to mention the bulky, outdated design. At Magic Window Innovations, we’ve worked to redesign these window features to make them perform more intuitively. Outdated insect screens block light, obstruct views and can become clogged with dirt and allergens over time. 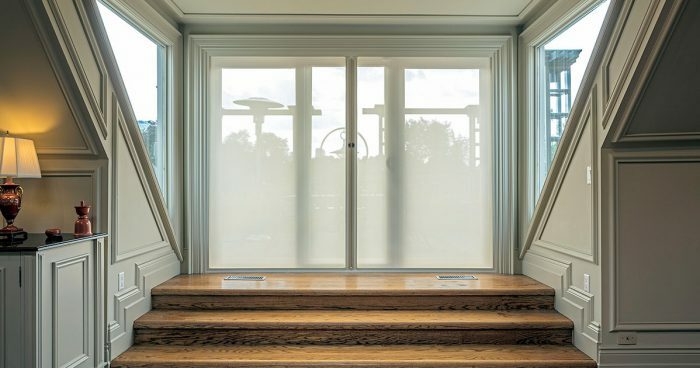 Built with our patented Retractable Slide ‘N’ Hide® technology, our fully retractable insect screens address these issues by allowing homeowners to fully control when and where they use their screens. These solar screens also utilize Retractable Slide ‘N’ Hide® technology. They allow for unprecedented control over how much solar light and heat enters through a window. The retractable option lets homeowners utilize or block out the sun’s heat whenever they choose to. Our fully-retractable thermal blind can double the insulating value of any window. It reduces utility bills by preventing comfortable internal air from escaping the home. Furthermore, the blind’s ability to retract allows for steady natural light transmittance that would have been permanently lost with an equivalent triple-glazed window. The blind can also completely block out light penetration, providing increased privacy and security. Despite all this information, homeowners will inevitably have more questions regarding replacement windows. That’s why we offer free, no hassle consultations. We understand that every home has unique needs based on its aesthetics, geography and construction. One of our certified project managers will help to explain the innovative design features that set our windows apart and how they can be customized to suit any home. Book a free consultation today and see first-hand why Magic Window Innovations produces the world’s most advanced replacement windows.